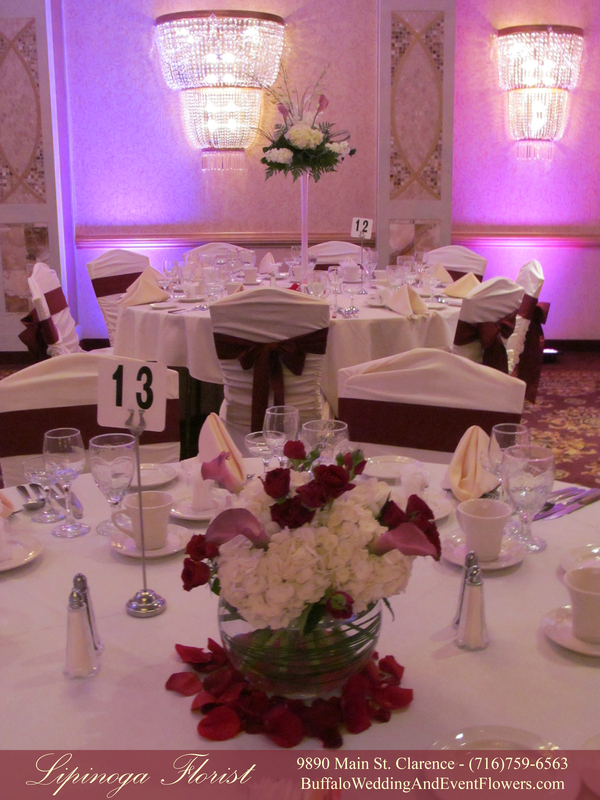 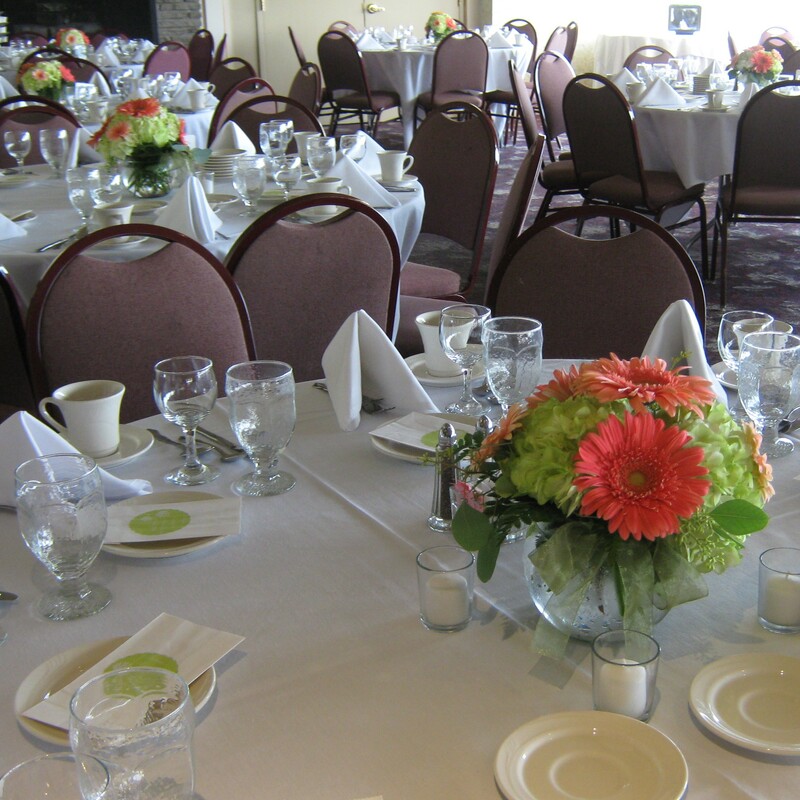 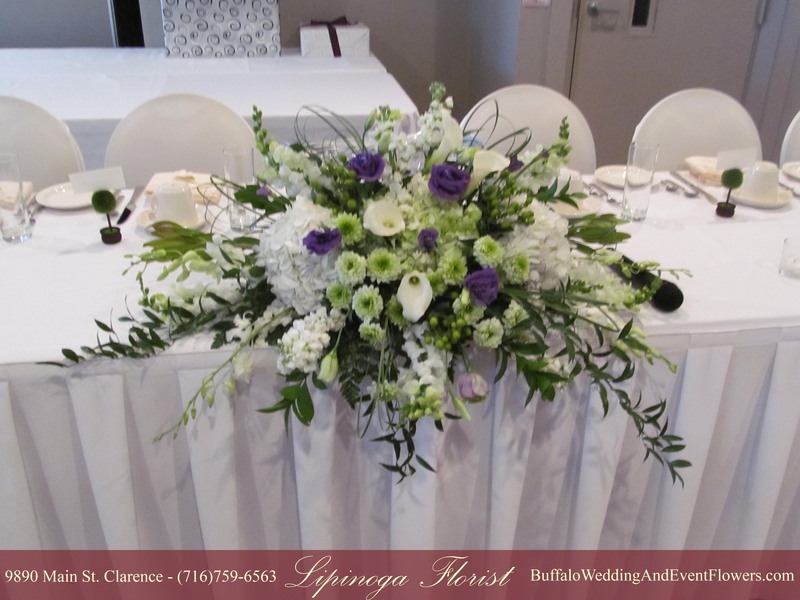 White miniature calla lilies accented by purple and green flowers and berries added a burst of color to the tables for this Bridal shower held at Milo’s Restaurant in Williamsville, NY. 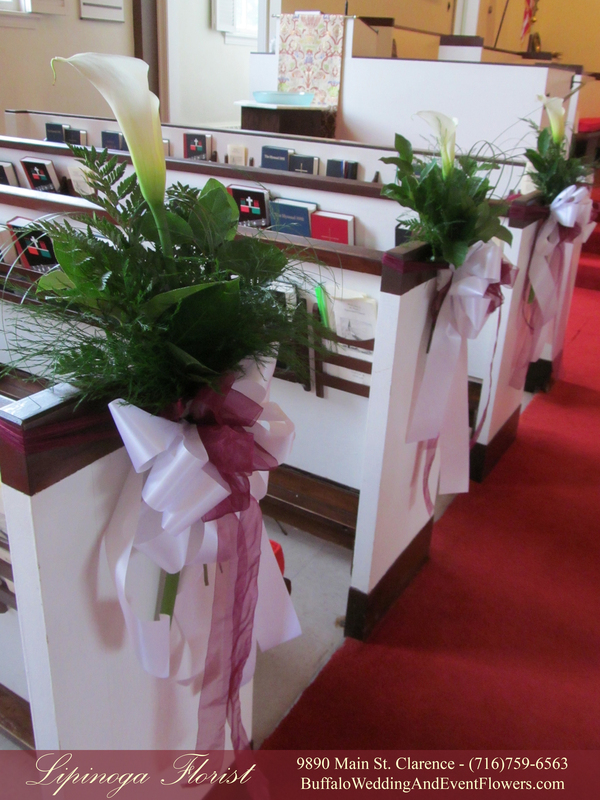 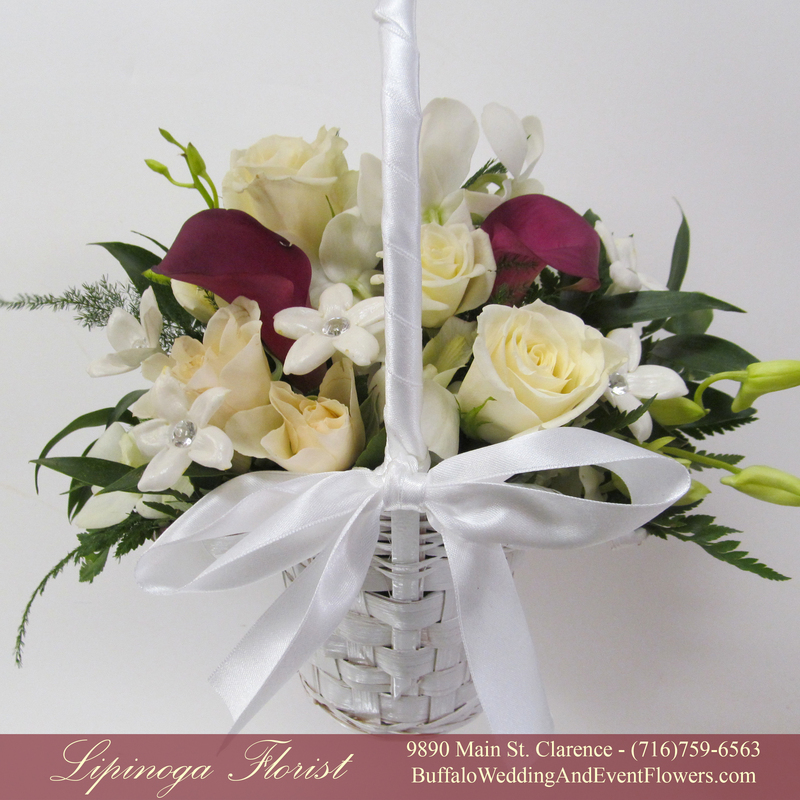 The flowers were arranged low and lush in a simple terracotta pot and tied with a ribbon. 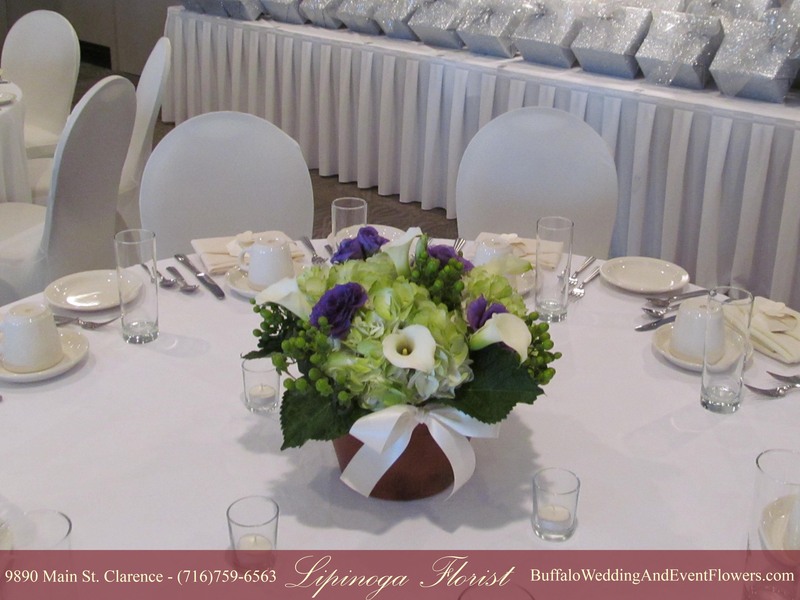 A few reserved tables were demarcated with more vibrantly hued hydrangeas while maintaining the same style of centerpiece. 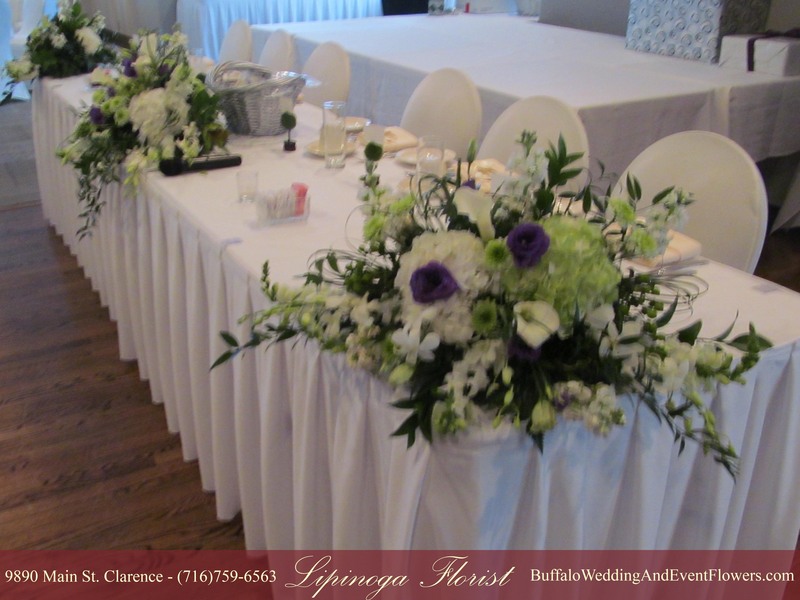 The head table was beautifully adorned by one large focal centerpiece and two arrangements on each end to create a spectacular display in the center of the room. 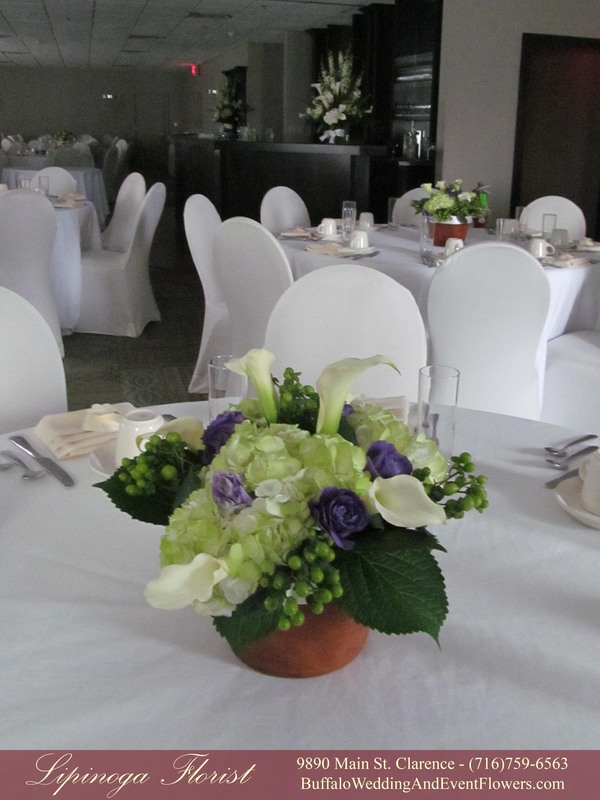 Guests received beautiful ivy plants in pots tied with satin bows to coordinate with the centerpieces, a lovely gesture that can continue to grow in each of their homes. 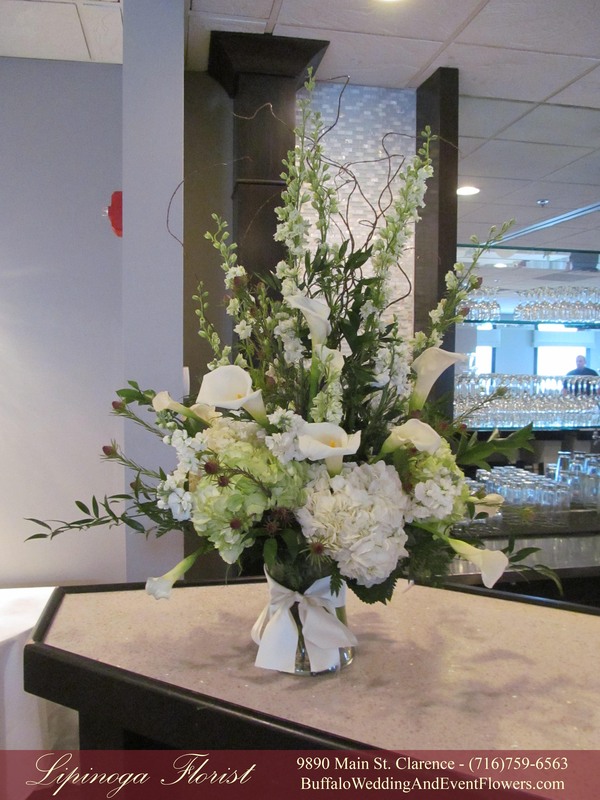 The bar and gift tables were accented with beautiful statement vases of all white and green blossoms including some branches and assorted greenery creating atmosphere within the space. 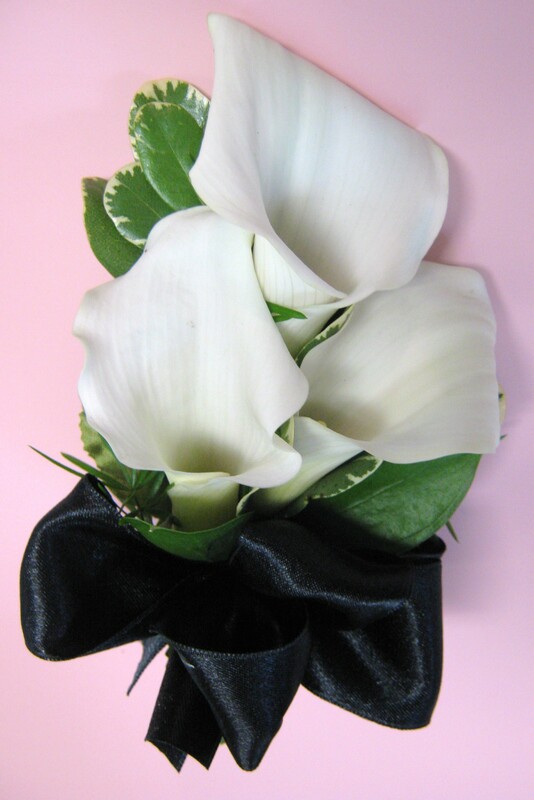 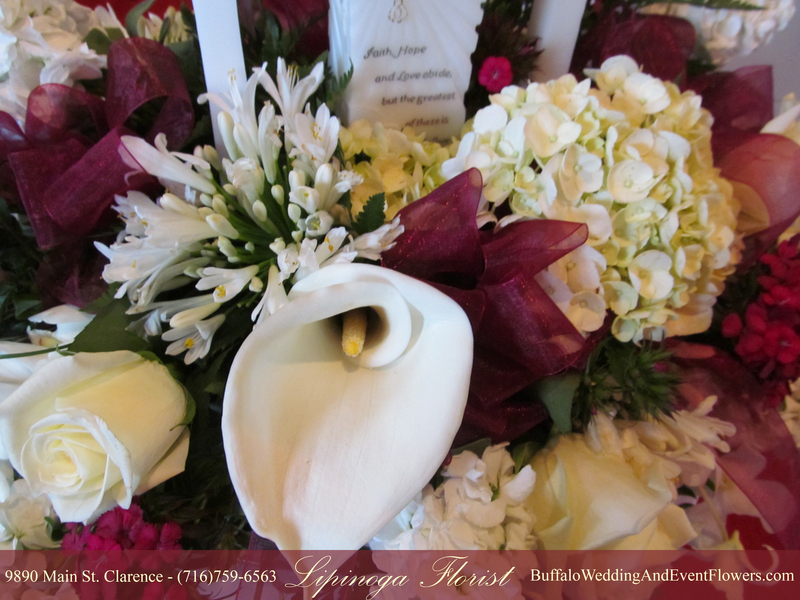 Large white calla lilies created a beautiful focal point along with assorted with blossoms in simple glass vases tied with a satin bow. 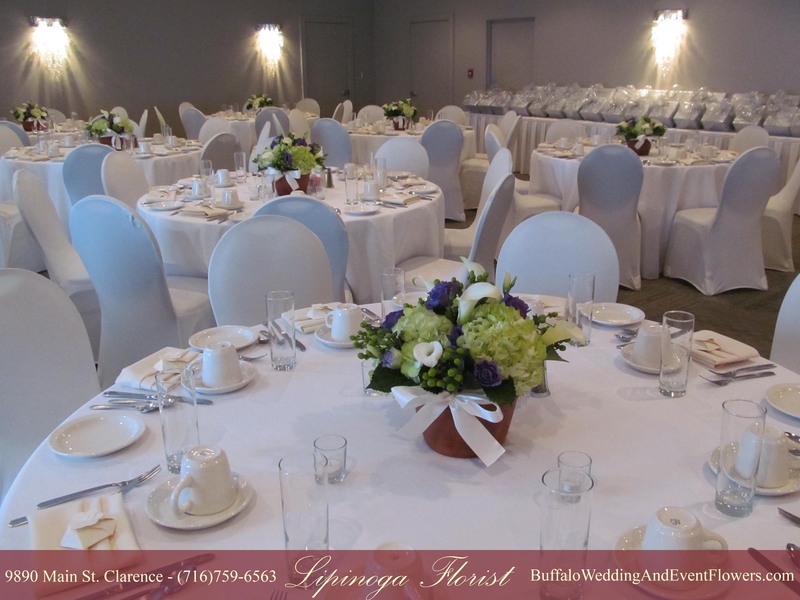 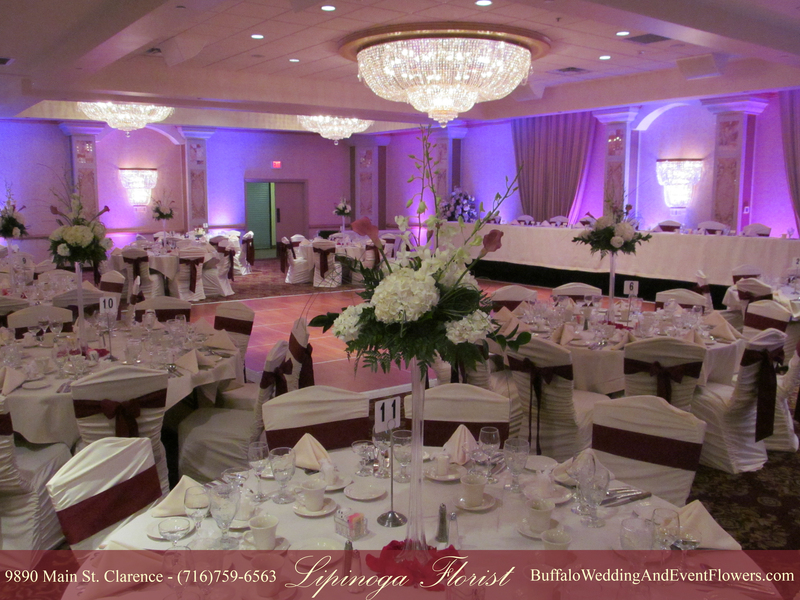 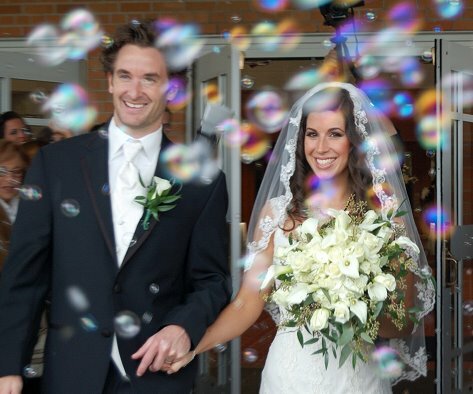 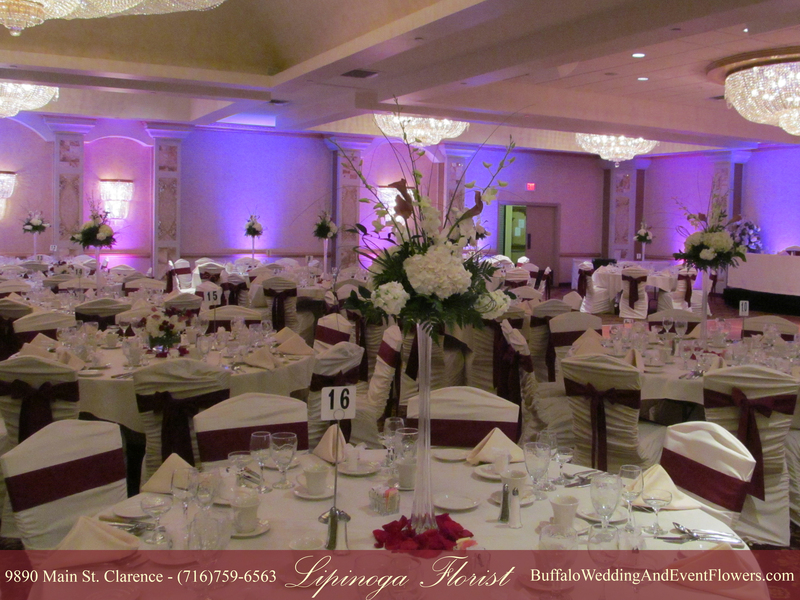 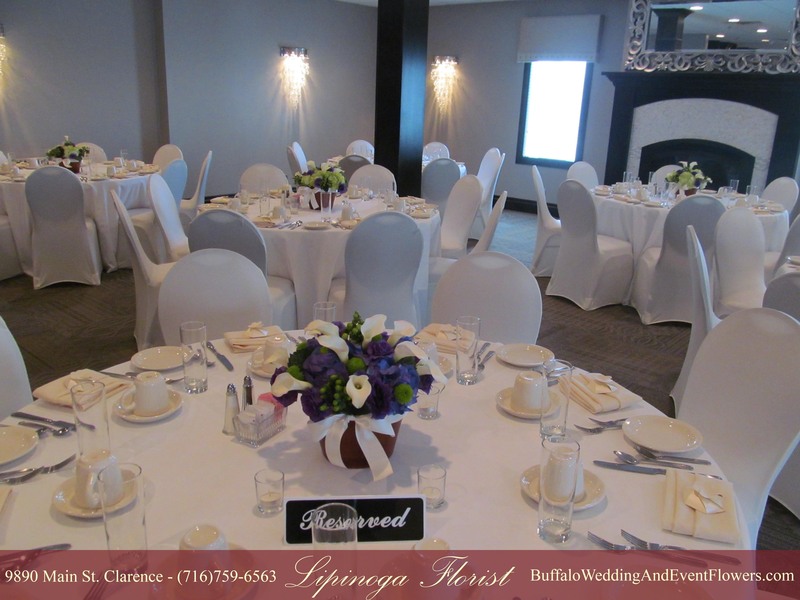 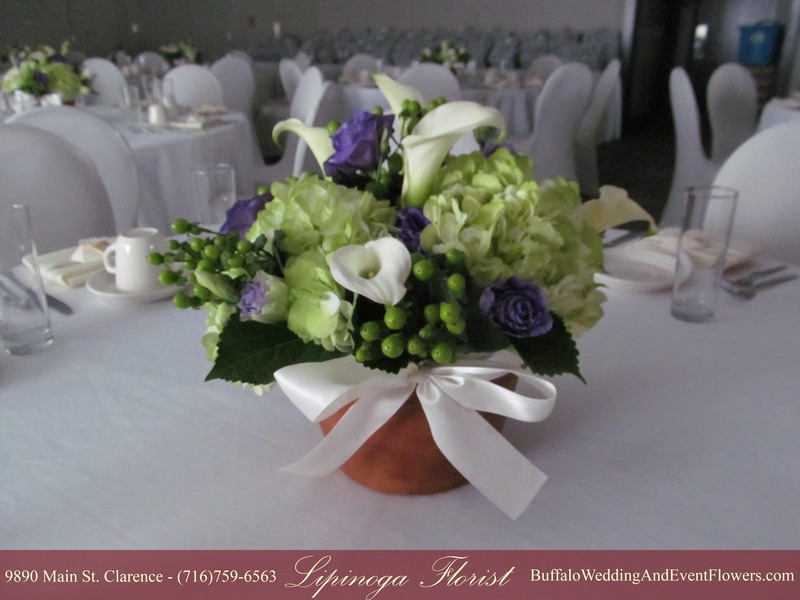 This real Buffalo Wedding by Lipinoga Florist featured shades of peach, white and cream. 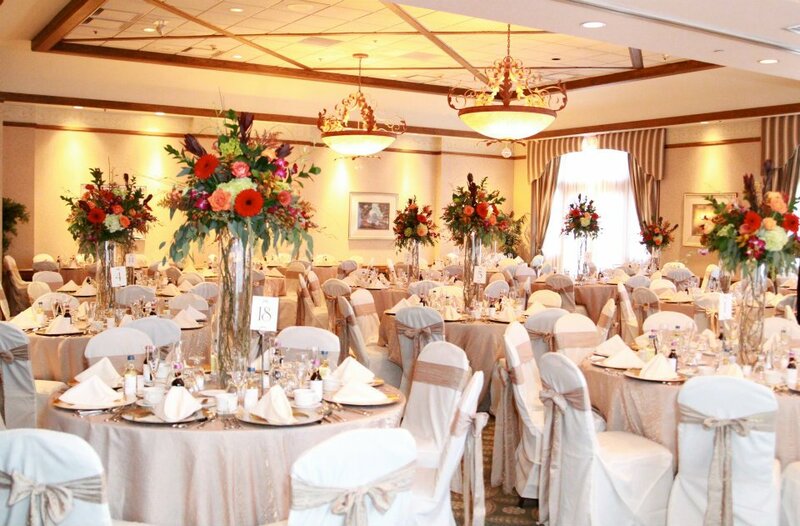 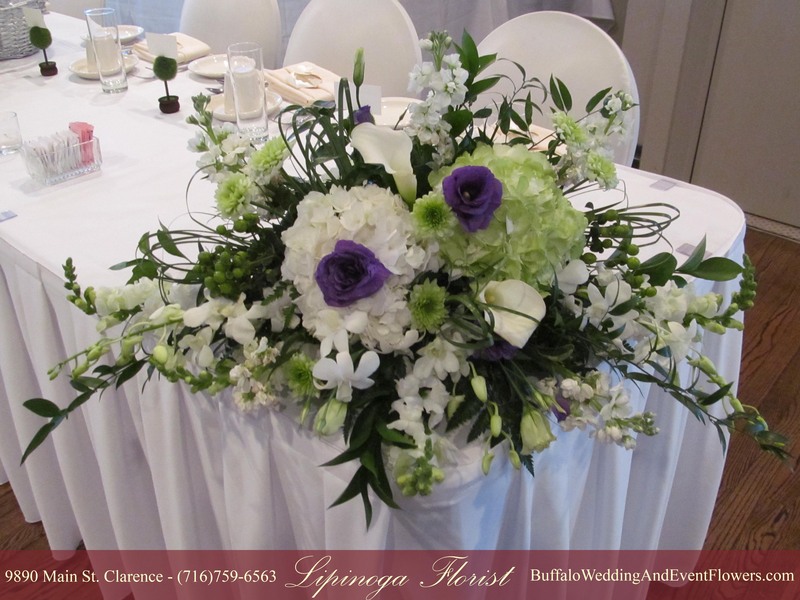 The soft hues and casually elegant blooms created a classic bridal look for a wedding at Glen Oak in Amherst, NY. 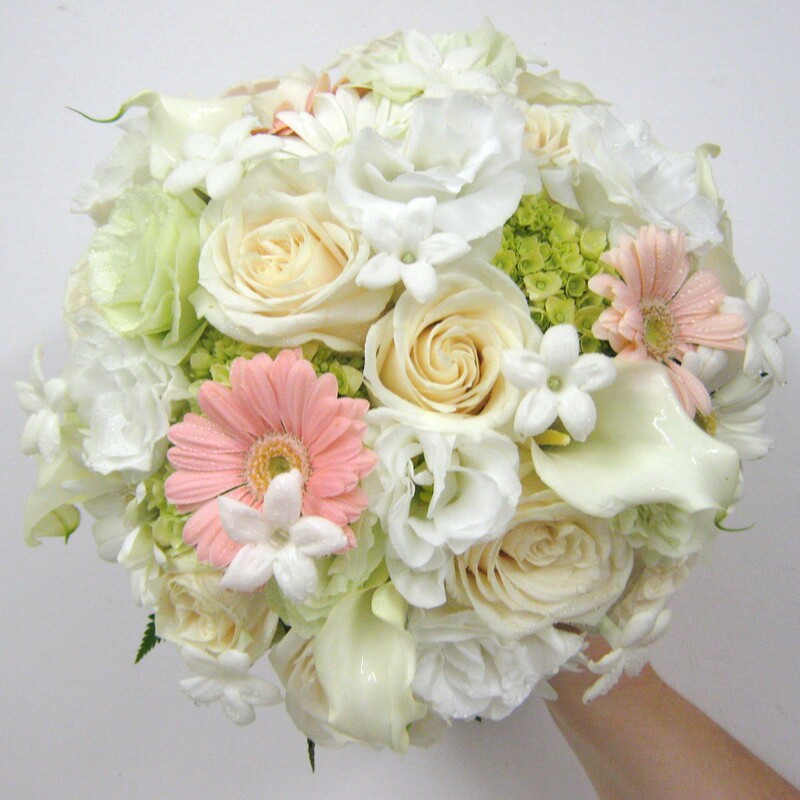 The bridal bouquet was a very elegant mix in soft hues of white, ivory, green and peach. 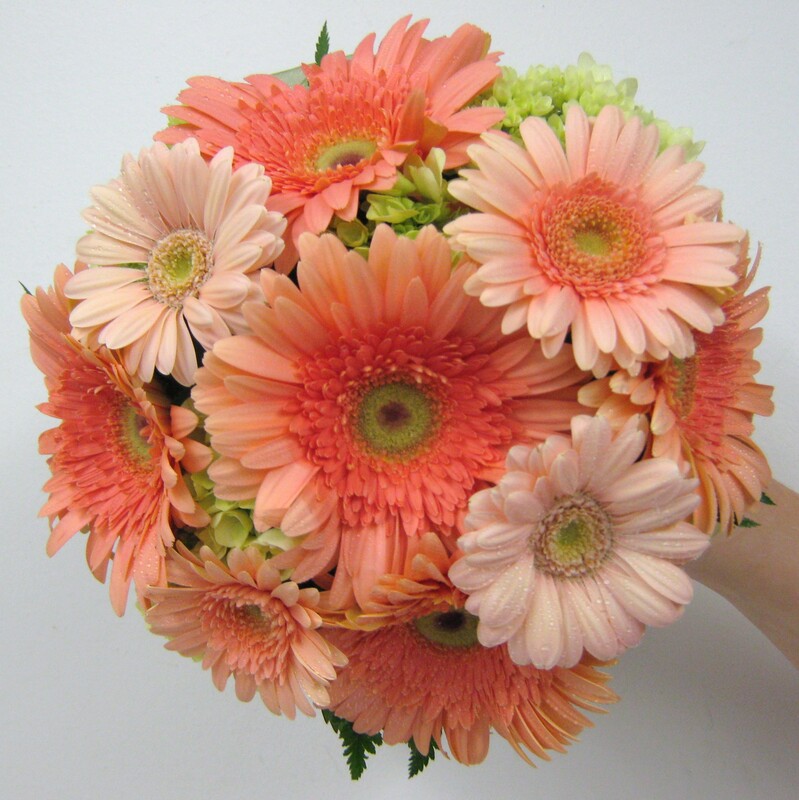 The bridesmaids carried a simpler bouquet of peach gerbera daisies in two shades accented by green hydrangea. 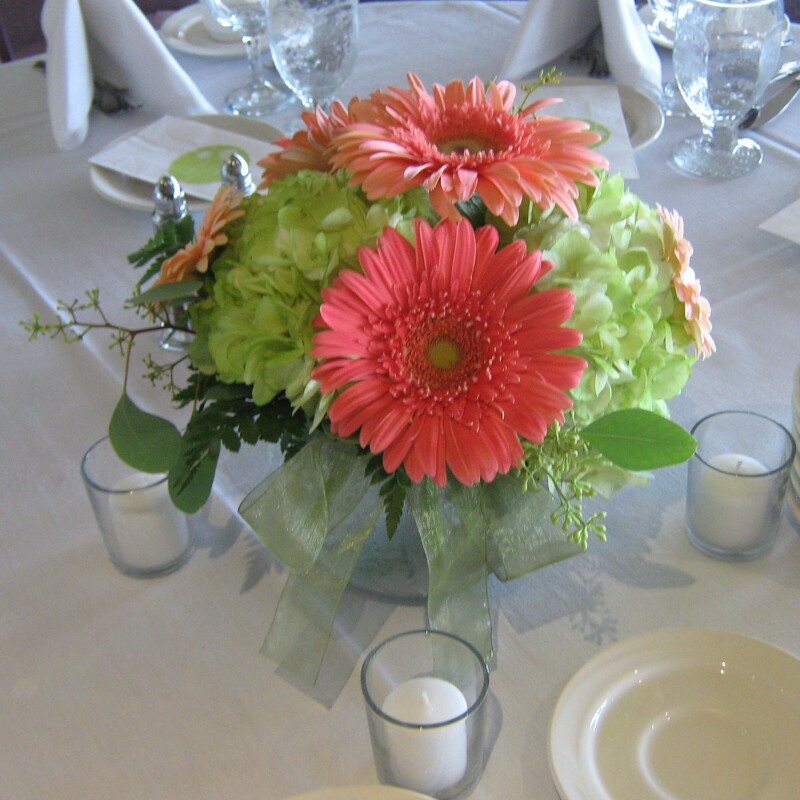 The table centerpieces designed to match the bridesmaids bouquets were made in bubble bowls and tied with a green ribbon to complement. 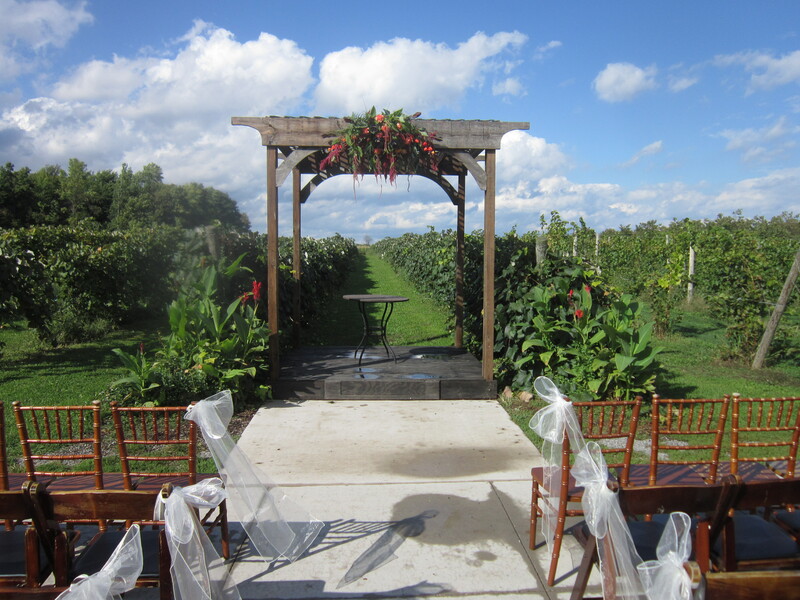 Becker Farms is a unique location for a rustic outdoor wedding ceremony and reception. 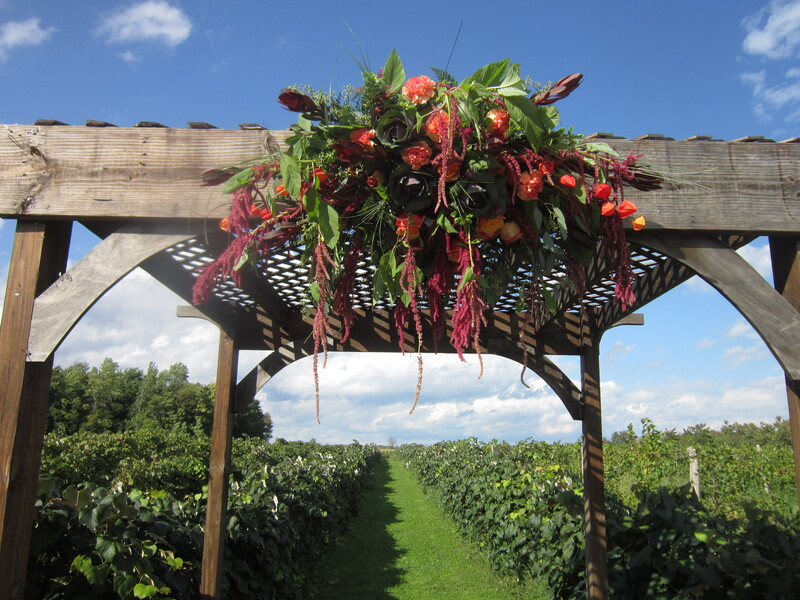 Anyone who grew up in Western New York has fond memories of visiting Becker Farms, and now many couples are creating memories of their own holding their weddings there. 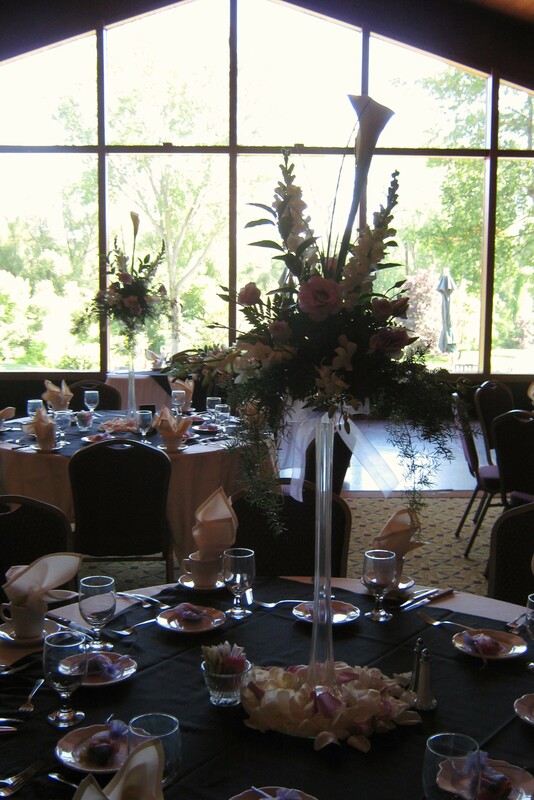 Flowers adorn the ceremony site located at Vizcarra Vineyards. 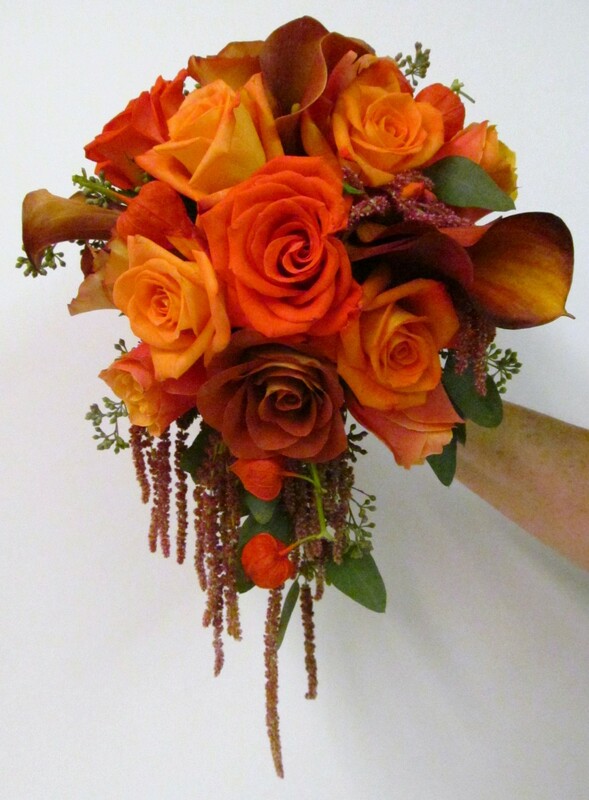 Kale, Chinese lanterns, roses and assorted fall flowers in autumnal hues accent the archway. 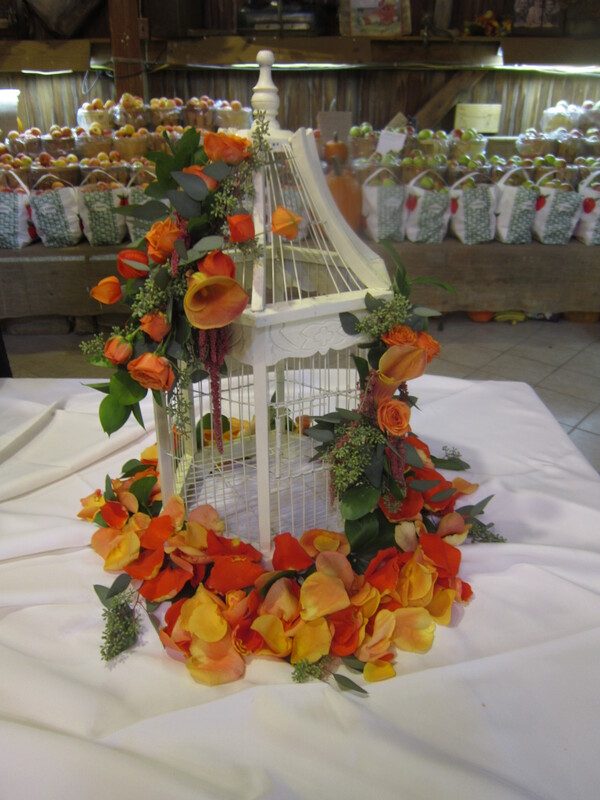 Chinese Lanterns, greenery, roses, calla lilies and roses create a unique card holder when surrounding a bird cage. 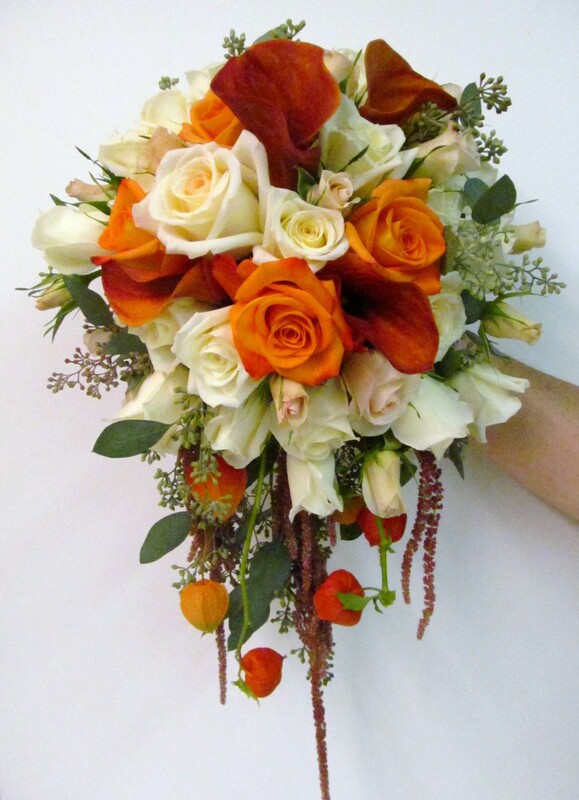 The bridal bouquet, designed by owner, Nancy Lipinoga, was a beautiful cascading bouquet of ivory roses, orange roses and mini calla lilies, with accents of greenery and Chinese lanterns. 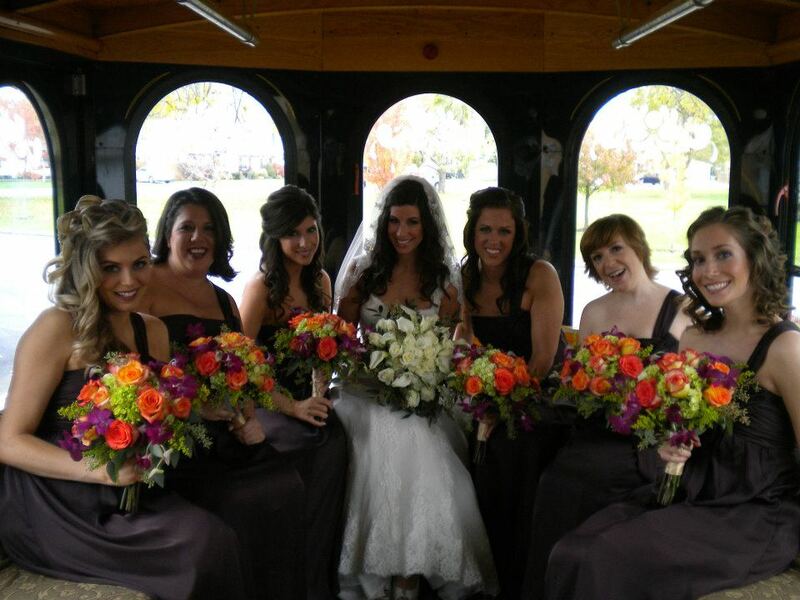 Her bridesmaids carried smaller cascading bouquets of fall colored roses and mini calla lilies accented by hanging amaranthus and Chinese lanterns. 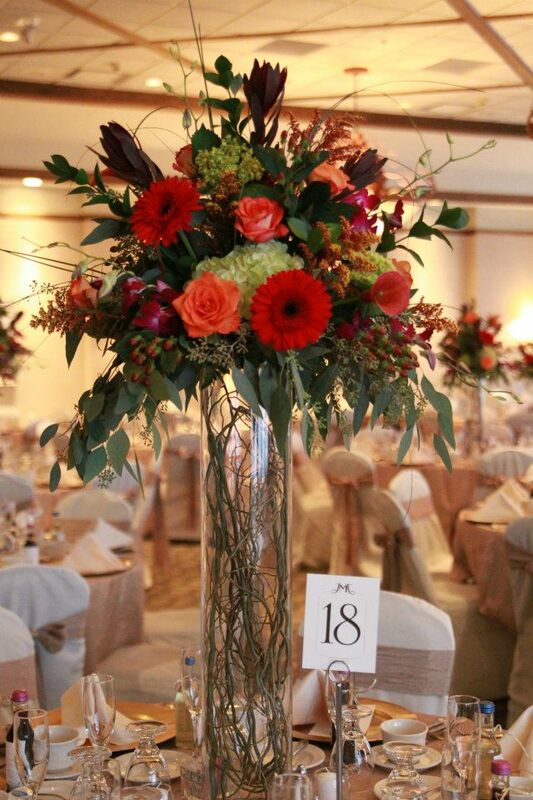 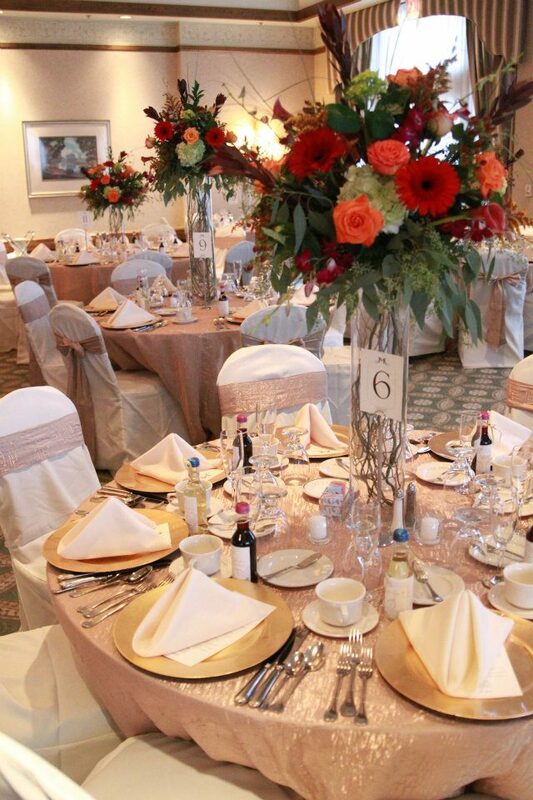 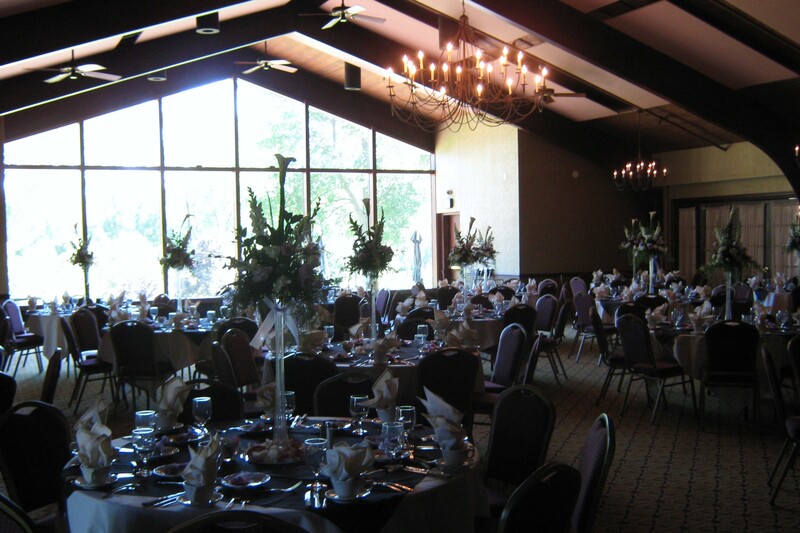 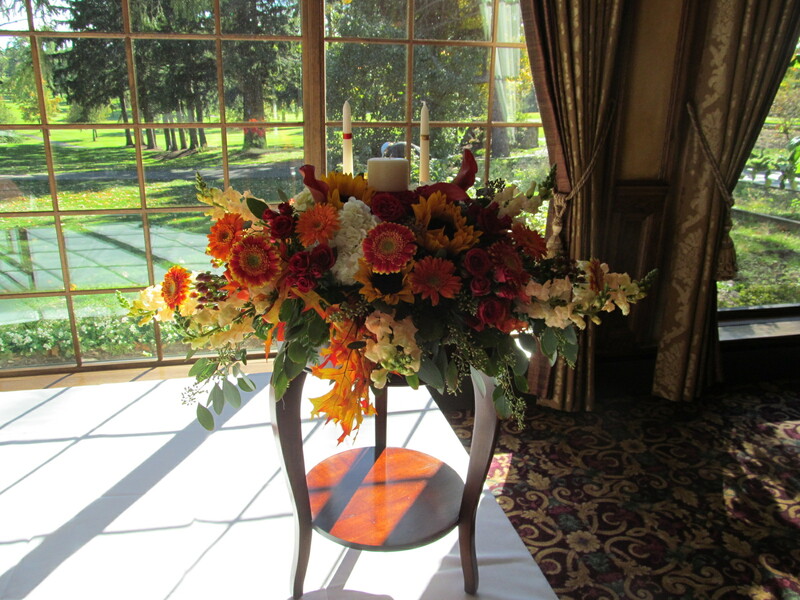 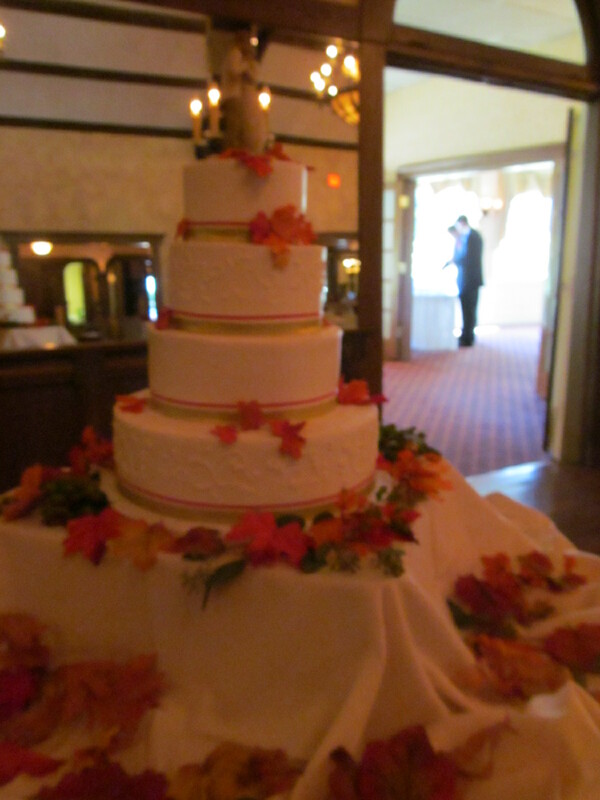 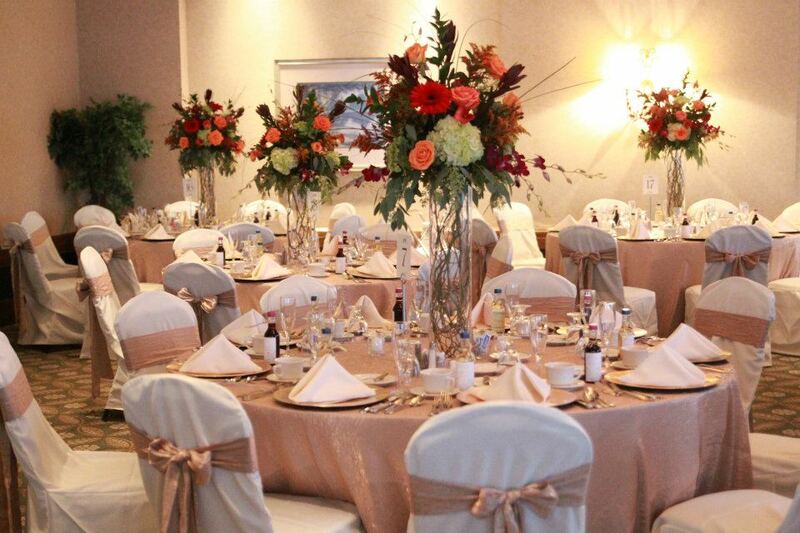 Becker Farms outdoor wedding ceremony area and rustic reception area are enhanced by fall floral arrangements. 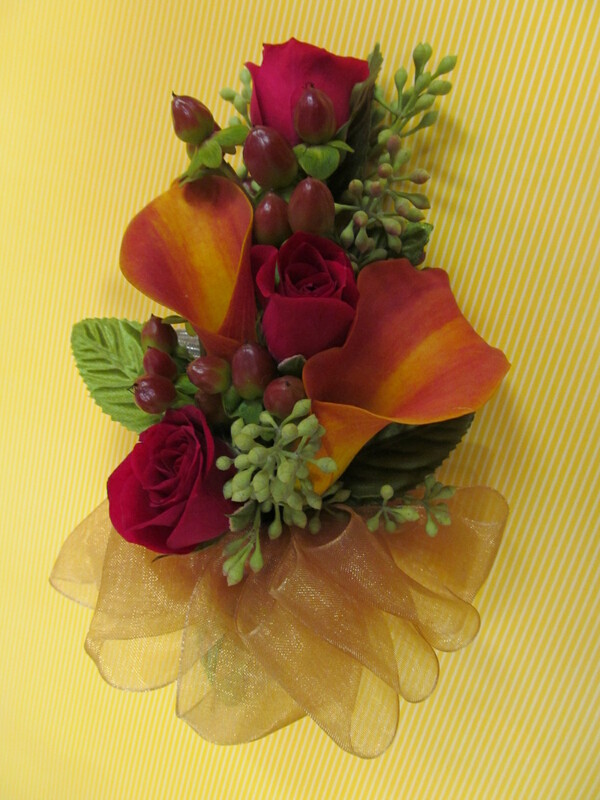 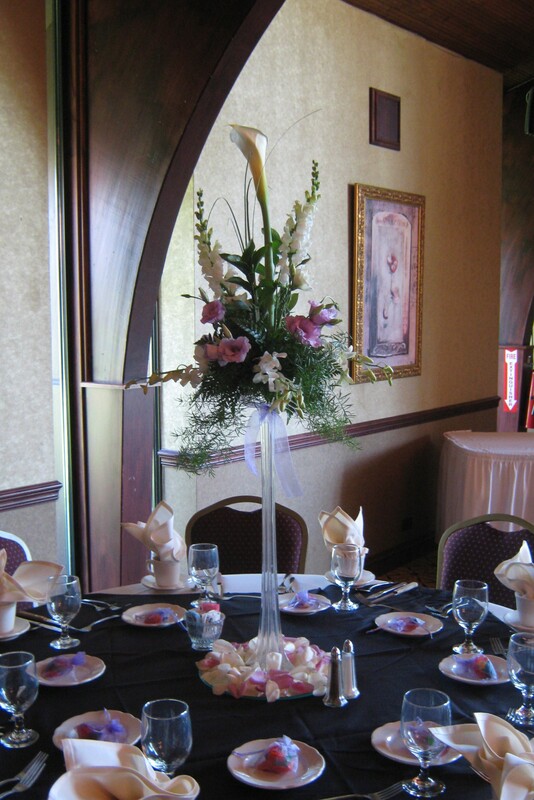 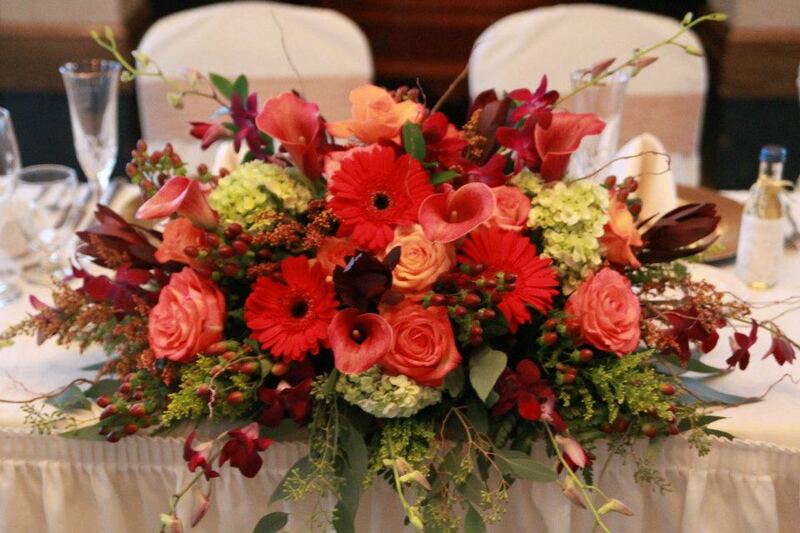 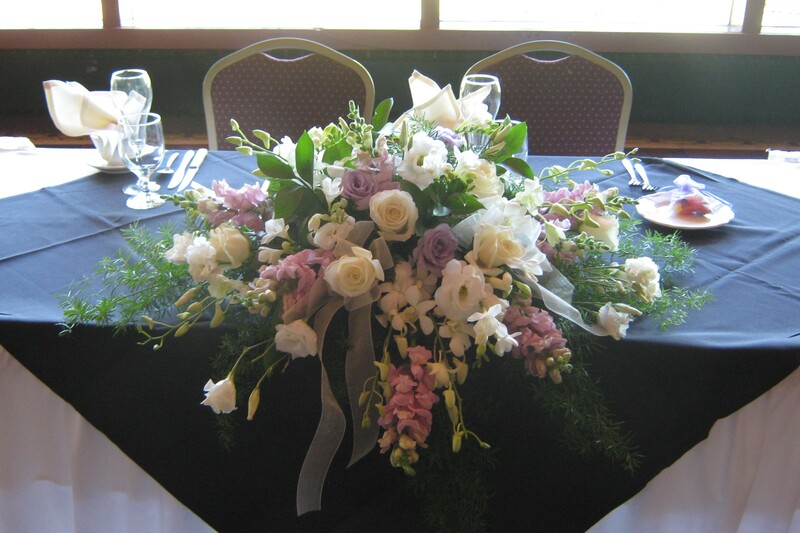 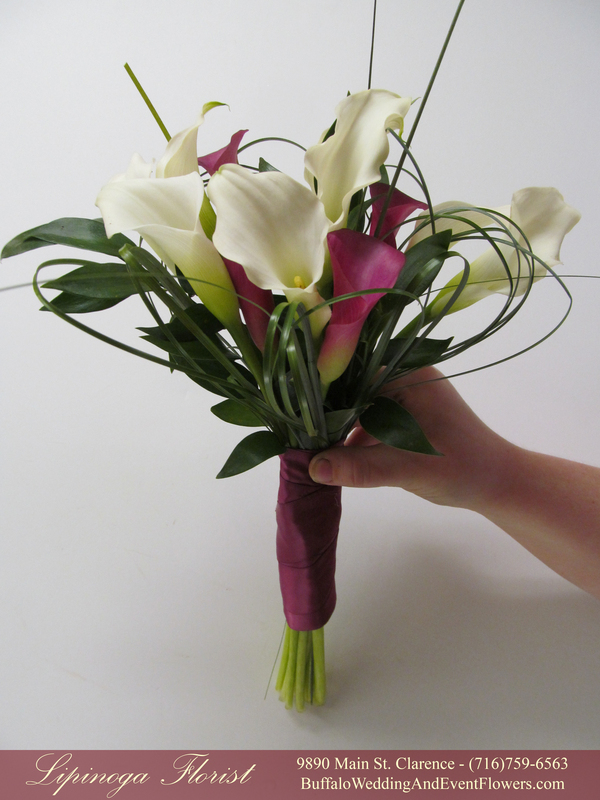 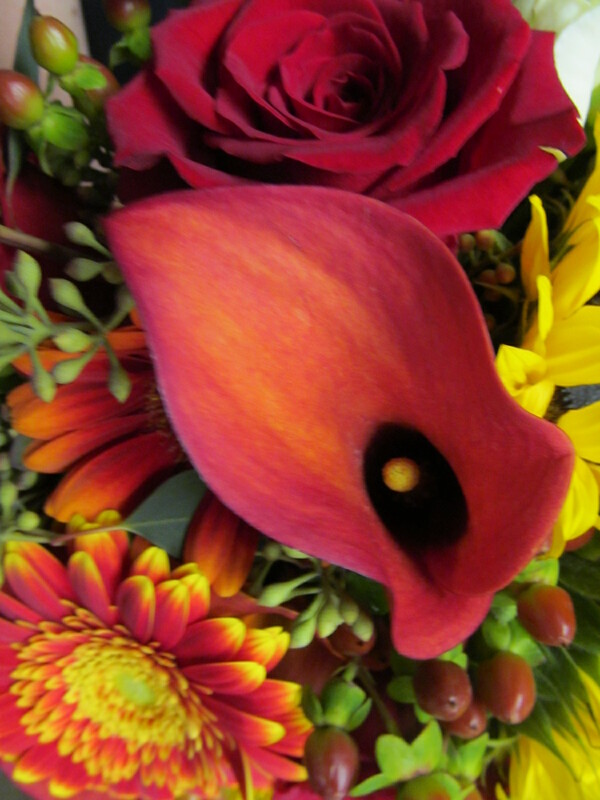 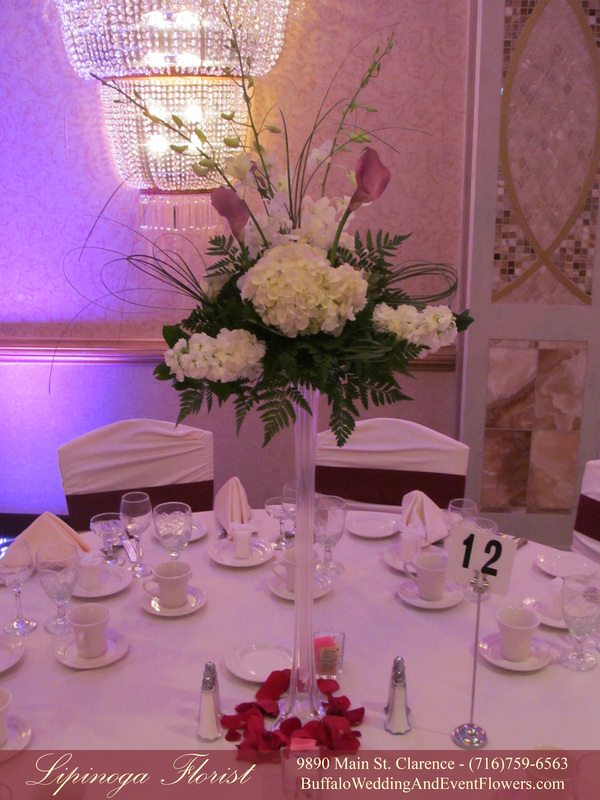 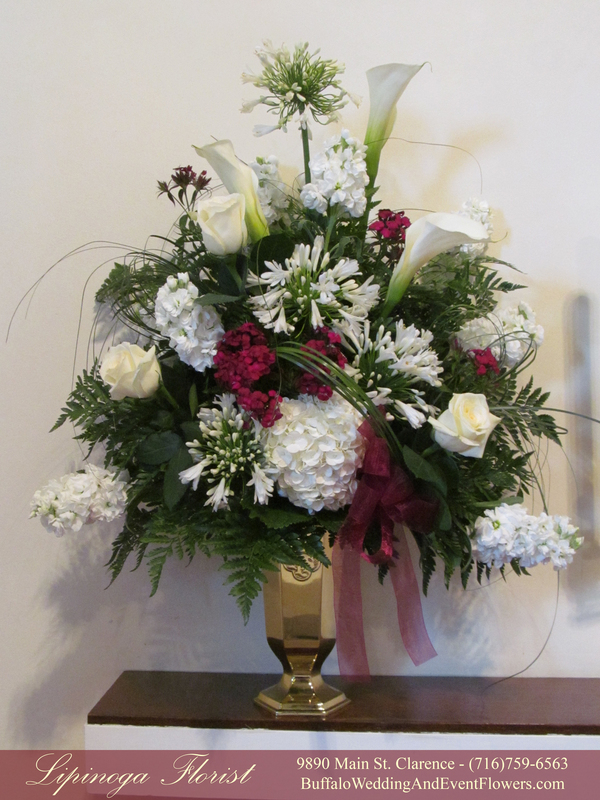 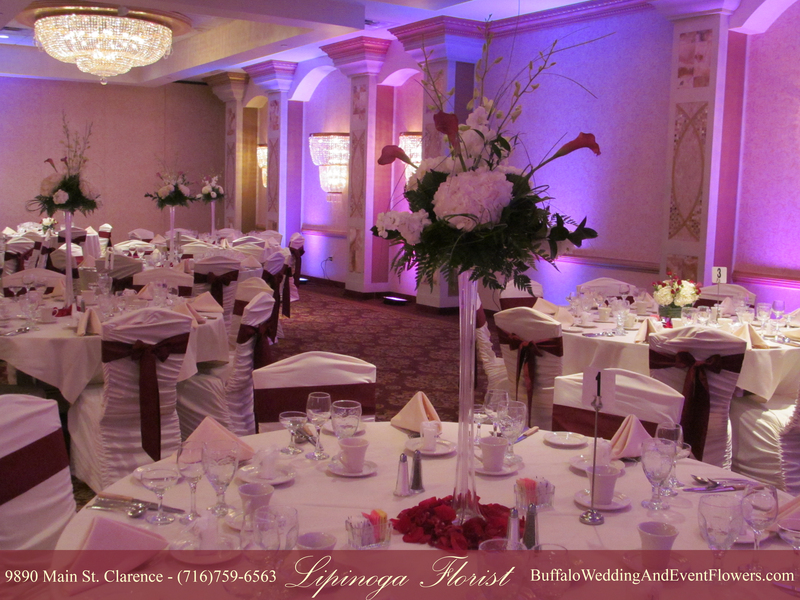 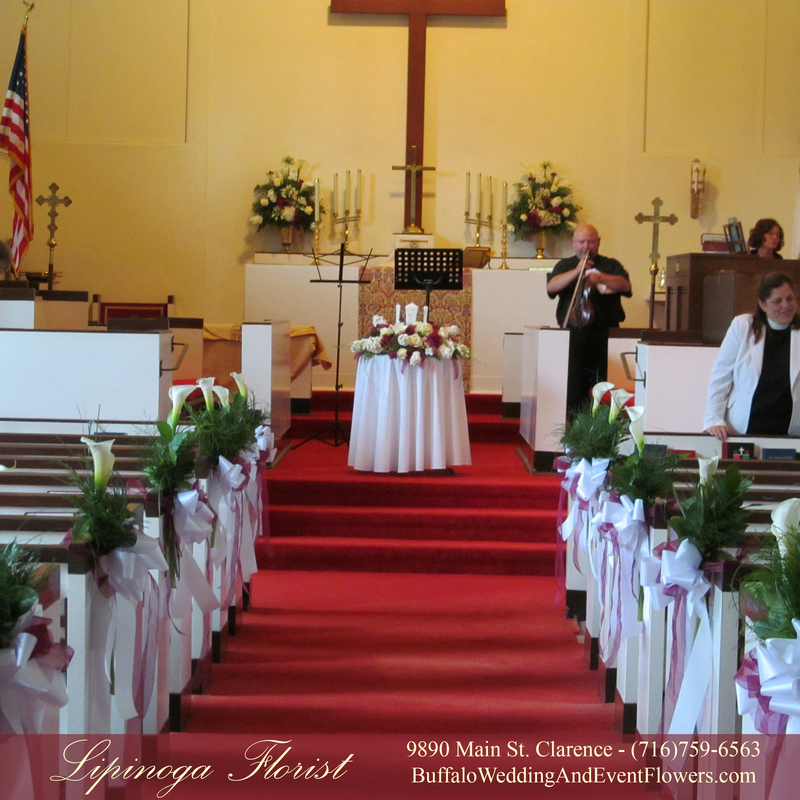 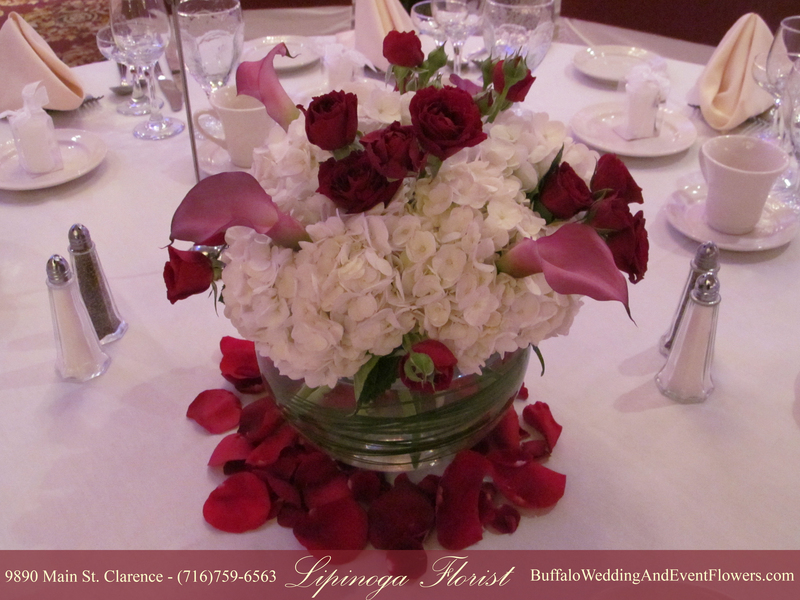 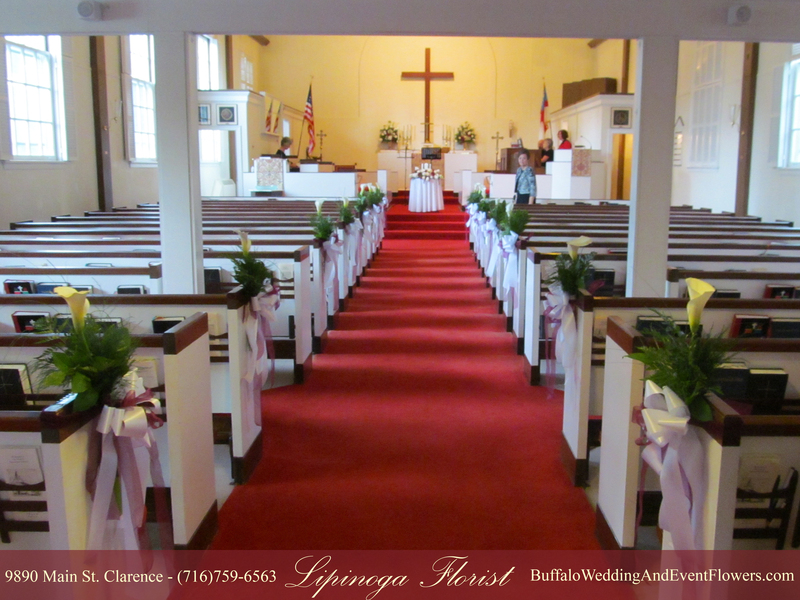 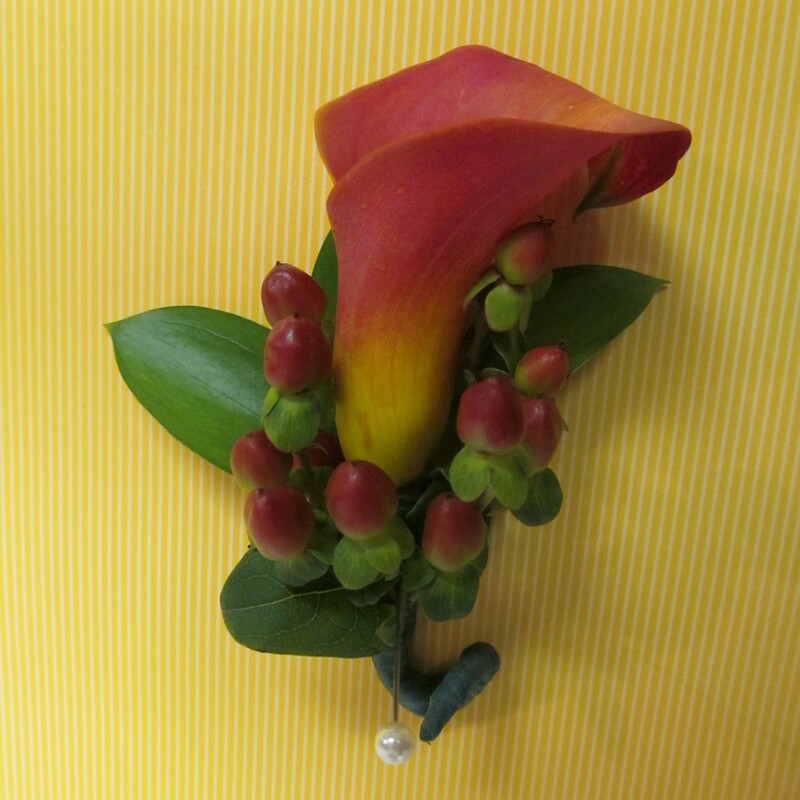 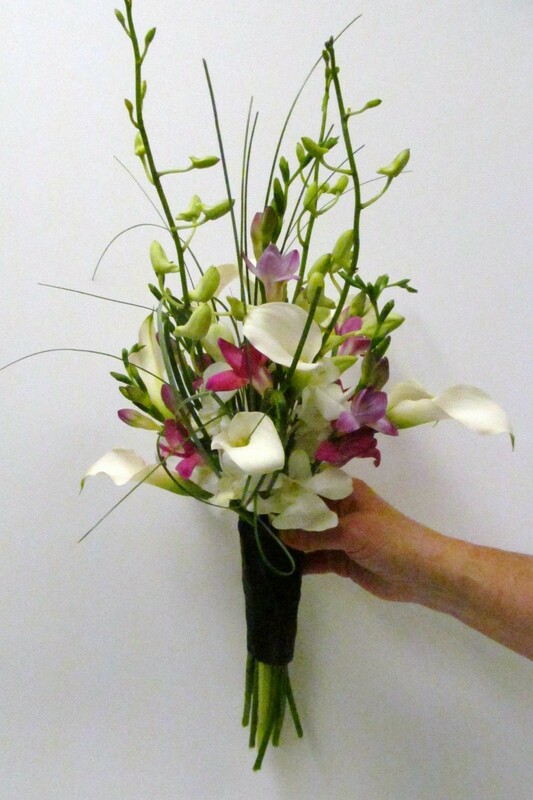 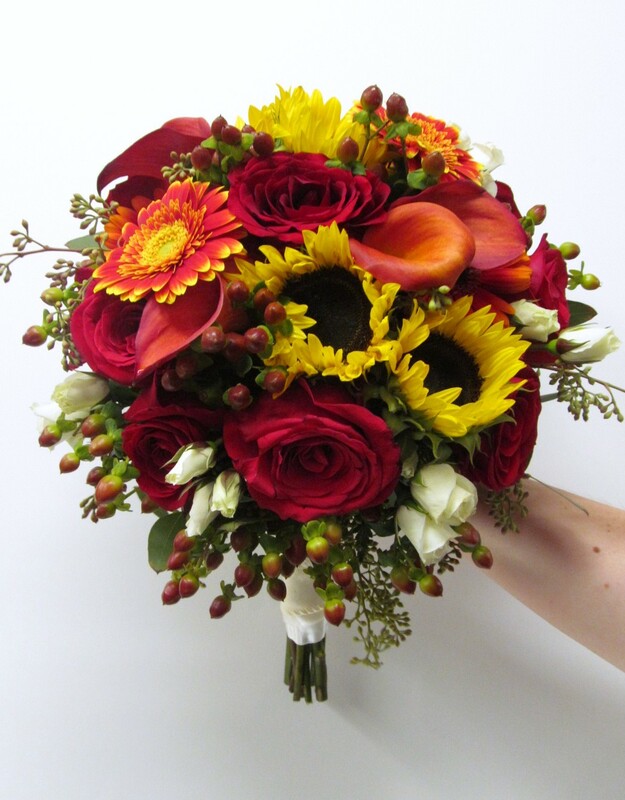 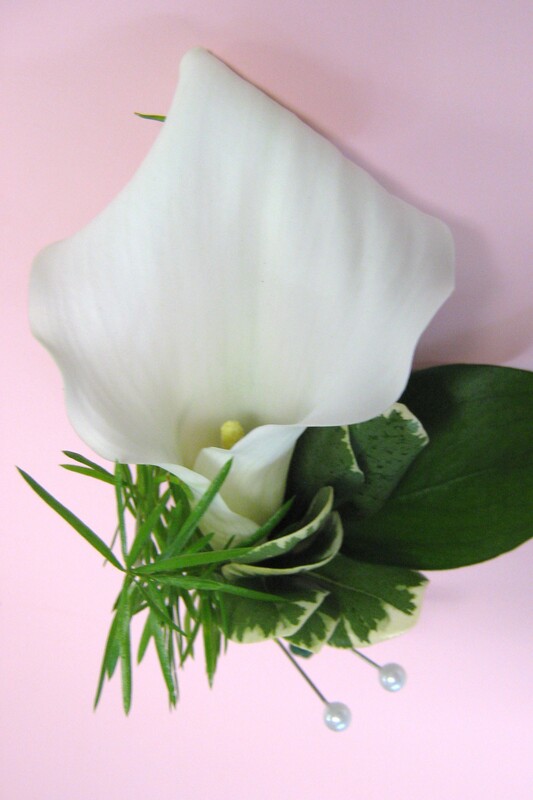 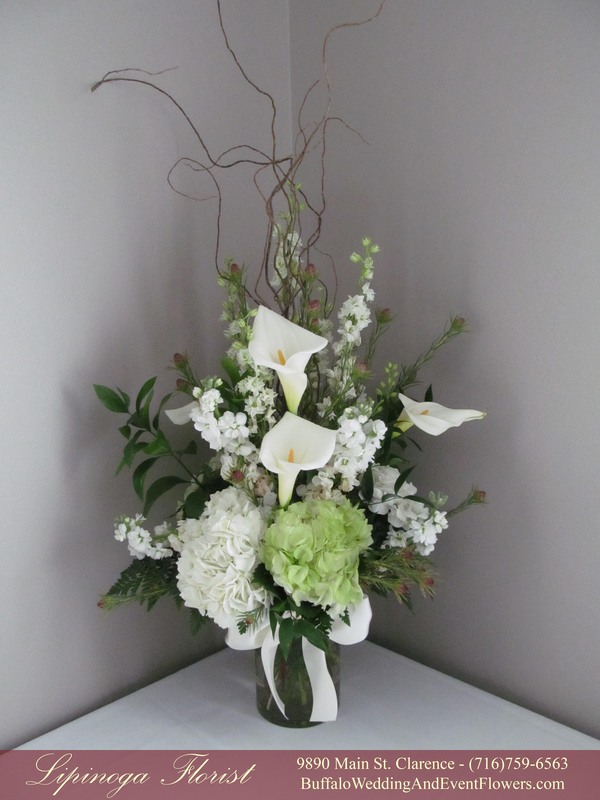 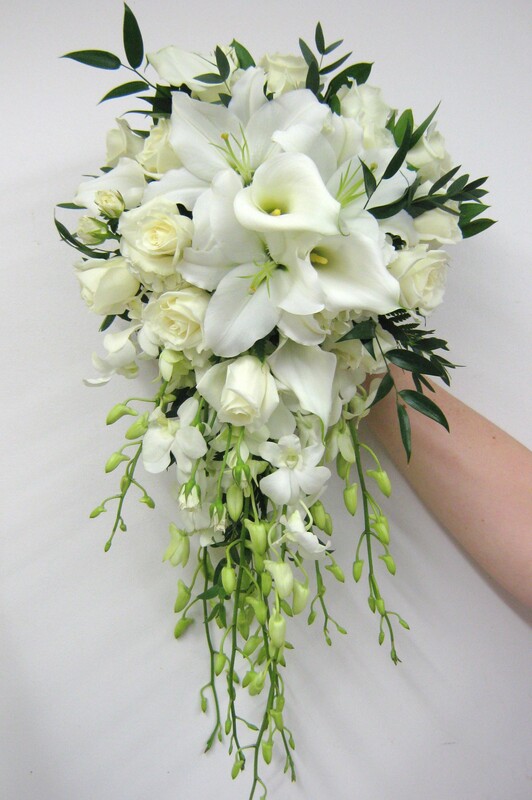 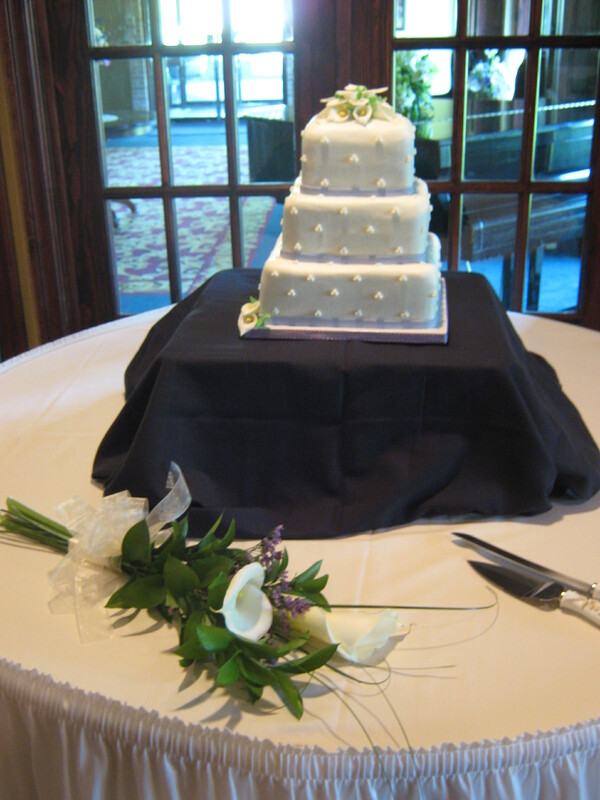 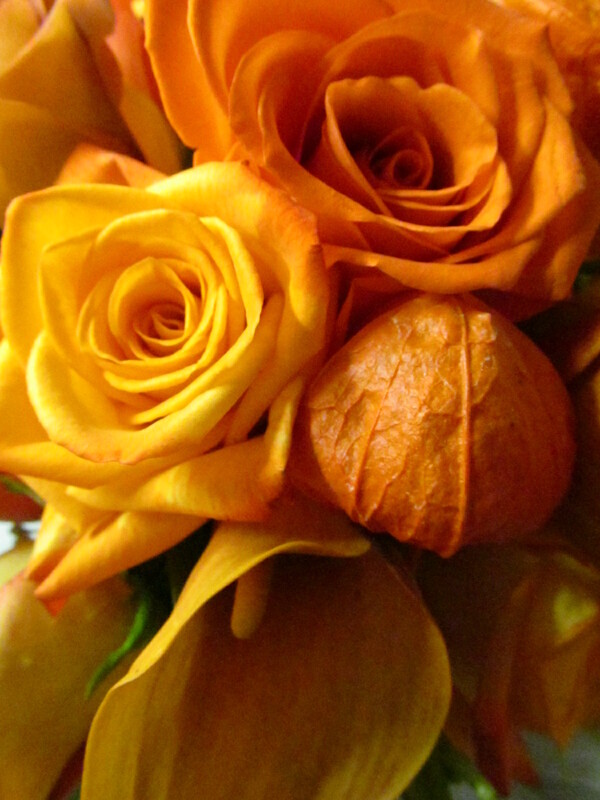 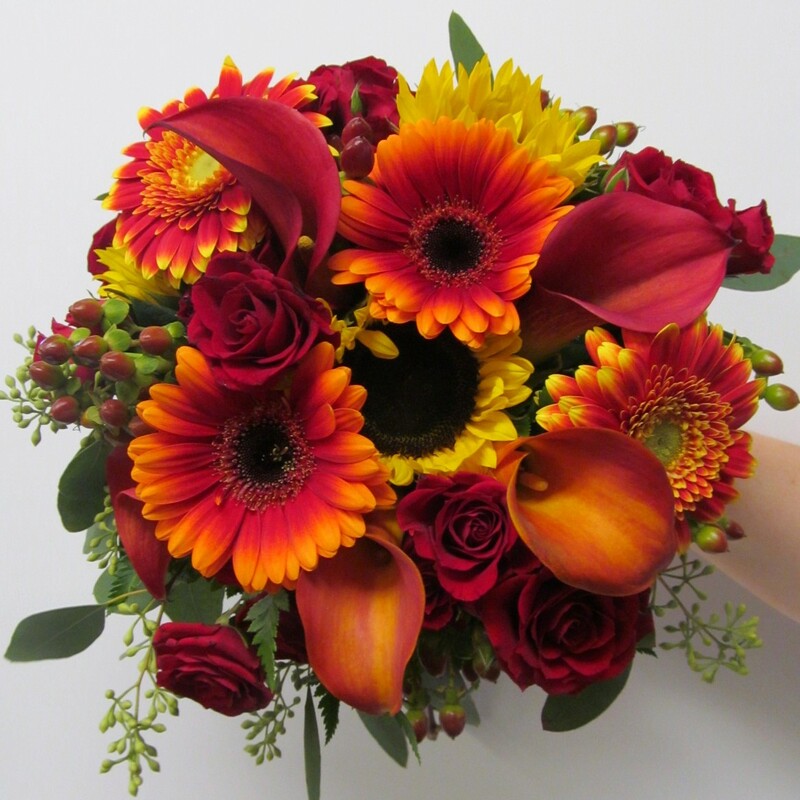 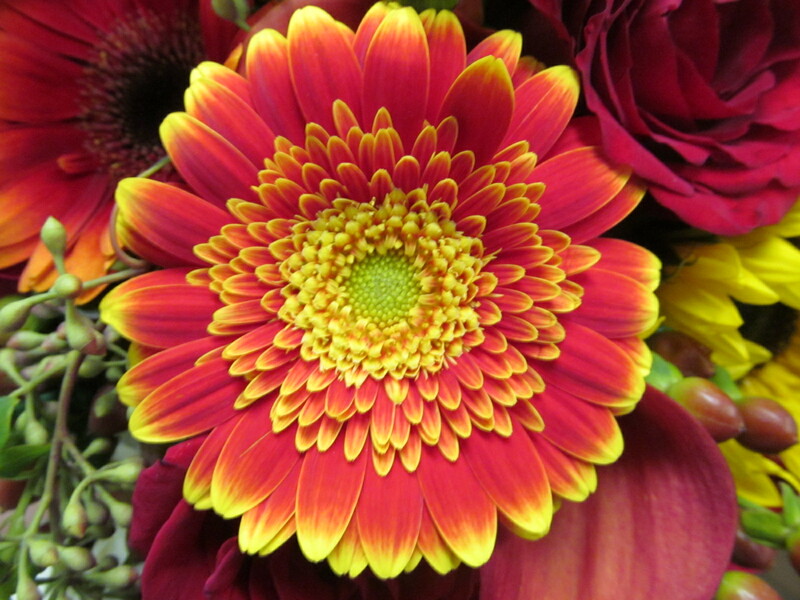 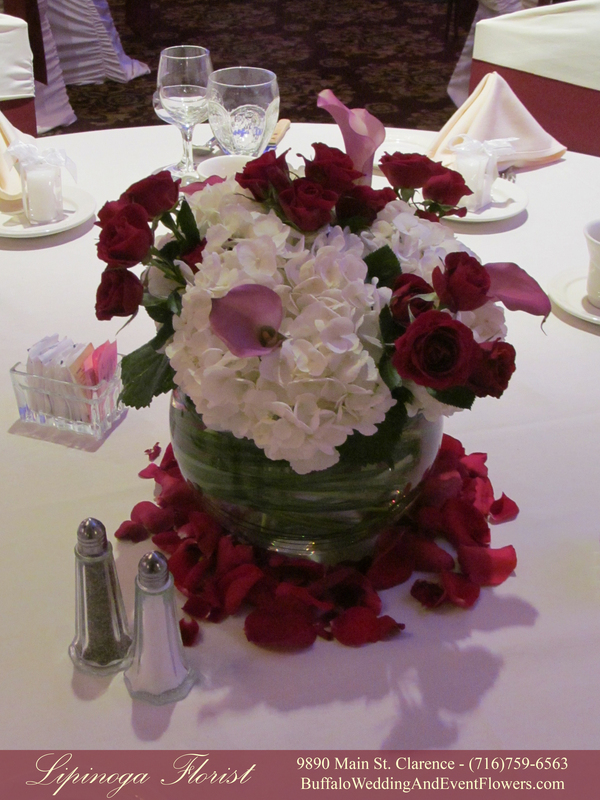 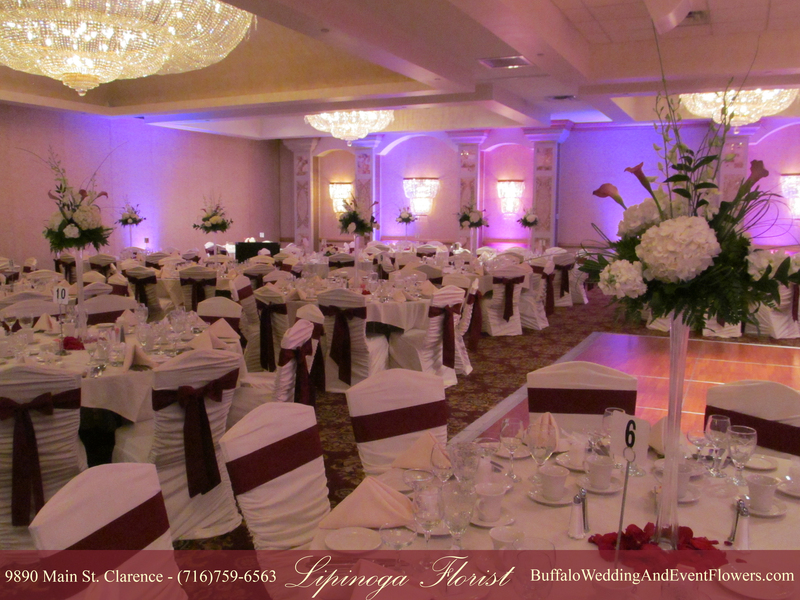 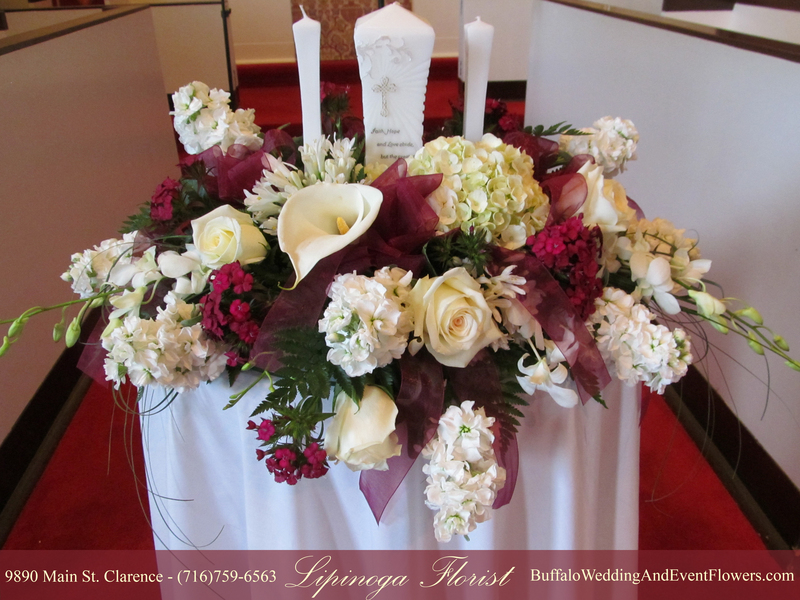 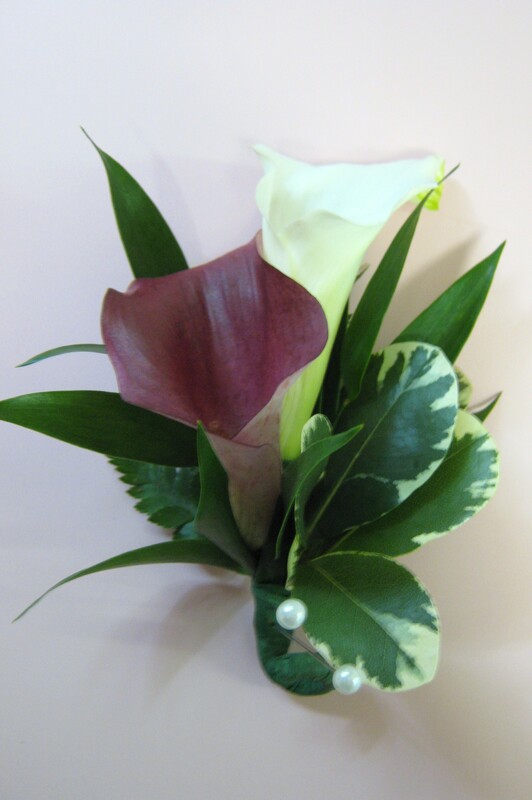 Contact our designers at Lipinoga Florist to schedule a personal consultation.